Wendell W. of Kennesaw, GA is the August winner. I have to say, I am close to astounded that I won the vintage pin loom!! I could count on less than one hand , I think, the number of things I have won on my 75 years. 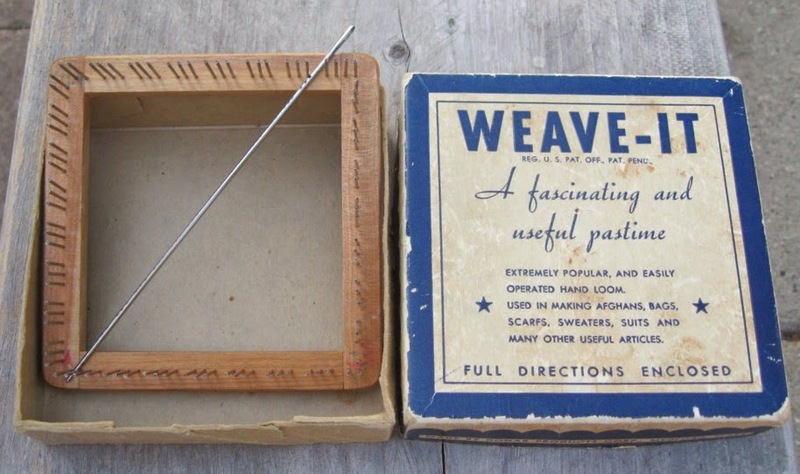 I'm pretty sure it was while living in the Dallas TX area in the mid 70's that I purchased my first pin loom - a Weave-It. (At that time I was becoming involved in rigid heddle and later 4 shaft weaving.) Since then I have acquired a few others -- new, used, wood, plastic. Pin weaving is such a fulfilling activity. Easy to do and keep at hand or travel with and not particular about the yarn it will accommodate. I have woven many hundreds of squares and other shapes on 2", 4" and rectangular looms. Are you signed up to win the Pin Loom Giveaways coming up at the end of each month? New videos on joining squares. One of the side effects of getting to correspond with other weavers due to the Woolery blog post is that I get to learn about some of the new forms or weaving appearing in the pin loom universe. Christine Thresh is a weaver, quilter, spinner, knitter and all around creative person who introduced me to her open ended pin loom approach. Here is Christine's pin loom surface, pins secured to a backing in order to make the exact size and shape she is looking for. And the Mochi Rainbow yarn is incredible. The next step is what blows me away. Christine simply takes up the looped selvage and transfers it to her circular knitting needles. Now she can finish the item, in this case a beret, and the weaving becomes immediately wearable. Below is another example of finishing techniques with a woven knitted beret, dampening the weaving and stretching/blocking with a dinner plate. This also shows off the clever transition from weaving to knitting. Christine pointed out that transitioning to crochet (for people like me who don't know how to knit and are too stubborn to learn) would work very well, too. This is just an admiring glance at Christine Thresh's weaving techniques. 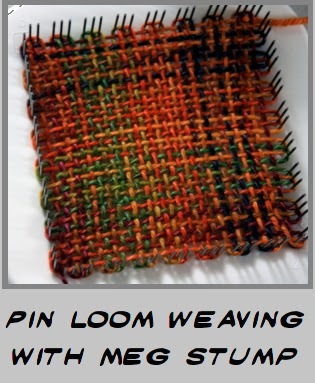 To learn more, check out her website, Winnowings and look for the free downloadable PDF on pin loom weaving in the round. 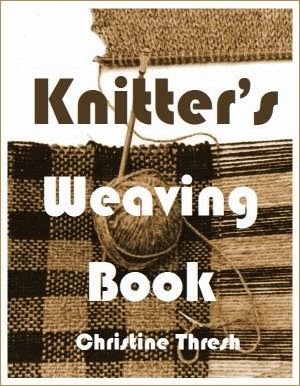 While you are there, please take a look at the book behind her incredible techniques, Knitter's Weaving Book. Christine describes, "For those of you who love running fibers through your fingers -- knitters and spinners -- this book gives you a simple way to expand your pleasure. Weaving on a light-weight, portable loom-board fits right in with your tactile delights. You can combine your woven pieces with your knitting. Imagine a stretchy soft cuff knitted right on to your woven jacket sleeve, or a woven vest with a knitted back." Thank you Christine, for sharing yet another approach to pin loom weaving. I had the opportunity to talk with some people from The Woolery who are now involved in putting together a special Critter Kit that includes gorgeous yarn, a Zoom Loom and directions to make one of several Critters. They were kind enough to invite me to talk/blog about pin looms, pin loom history, stuff you can do with them... etc. My only difficulty was that I felt bad about not putting the same material right here. And then I realized, I can do that. So here is the link for Pin Loom Weaving with Meg Stump! As it mentions at the end of the article, I am looking for pictures of pin loom projects, whether completed, still under way or stuck. I would like to put a page of all our works together, but I'm not posting it until I have a bunch so that no one has to worry about what someone else has sent in. I don't have a lot of experience with Pin Looms. I am new to any kind of weaving. I have done some yarn weaving on pot holder looms and have a triangle loom. I am excited to see what I can make with a pin loom. Melanie is one of the many Pinloomweaving readers who check in from across the world. She is looking forward to getting her book and loom. You asked me to share a bit more about myself: I am 47. My paternal grandmother taught me all kinds of needlework, knitting, crocheting and needlepoint when I was 7 or 8. I have always loved the feel of hand-woven fabric, and tried learning on a rigid heddle loom, but a traumatic warping experience led to my selling my loom before I ever even used it. About a year ago, I read about weave-it looms on Ravelry, and was able to purchase one on eBay. I love weaving little squares on this loom--I especially like seeing the way the weaving changes my expectations for the way hand-dyed yarns work up. But, so far, I haven't found many projects that I like that can be made with these little squares--and whenever I DO try to make something from them, I am REALLY unhappy with the options I have seen for joining. So, I am really looking forward to learning from your book. Thanks for choosing me for this contest!! Don't forget that there are going to be pin loom giveaways each month thru December. Its not too late to sign up!